Wireless community networks are a successful example of a collective where communities operate ICT infrastructure and provide IP connectivity based on the principle of reciprocal resource sharing of network bandwidth. This sharing, however, has not extended to computing and storage resources, resulting in very few applications and services which are currently deployed within community networks. Cloud computing, as in today’s Internet, has made it common to consume resources provided by public clouds providers, but such cloud infrastructures have not materialized within community networks. We analyse in this paper socio-technical characteristics of community networks in order to derive scenarios for community clouds. Based on an architecture for such a community cloud, we implement a prototype for the incentive-driven resource assignment component, deploy it in a testbed of community network nodes, and evaluate its behaviour experimentally. Our evaluation gives insight into how the deployed prototype components regulate the consumption of cloud resources taking into account the users’ contributions, and how this regulation affects the system usage. Our results suggest a further integration of this regulation component into current cloud management platforms in order to open them up for the operation of an ecosystem of community cloud. Community networks offer a shared communication infrastructure where communities of citizens build and own open networks. While the IP connectivity of the networking devices is successfully achieved, the number of services and applications available from within the community network is typically small and the usage of the community network is often limited to providing Internet access to remote areas through wireless links. 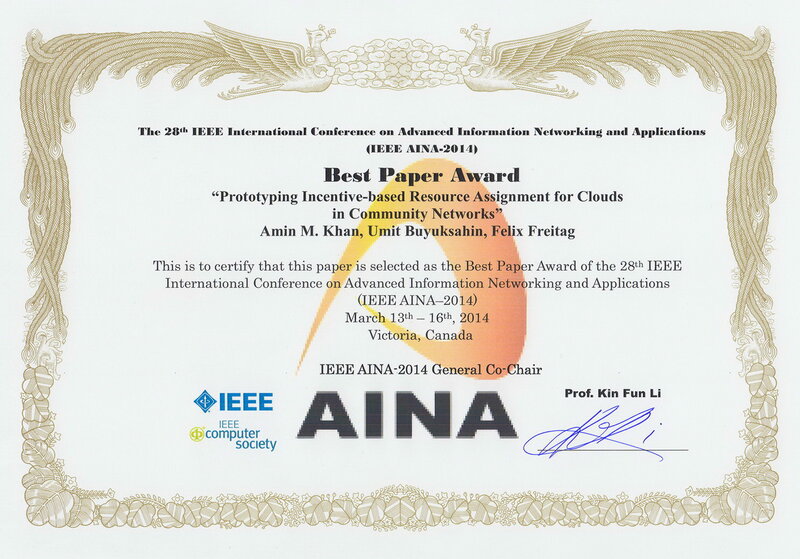 In this paper we propose to apply the principle of resource sharing of community networks, currently limited to the network bandwidth, to other computing resources, which leads to cloud computing in community networks. Towards this vision, we review some characteristics of community networks and identify potential scenarios for community clouds. We simulate a cloud computing infrastructure service and discuss different aspects of its performance in comparison to a commercial centralized cloud system. We note that in community clouds the computing resources are heterogeneous and less powerful, which affects the time needed to assign resources. Response time of the infrastructure service is high in community clouds even for a small number of resources since resources are distributed, but tends to get closer to that of a centralized cloud when the number of resources requested increases. Our initial results suggest that the performance of the community clouds highly depends on the community network conditions, but has some potential for improvement with network-aware cloud services. The main strength compared to commercial cloud services, however, is that community cloud services hosted on community-owned resources will follow the principles of community network and will be neutral and open. Community networks are built with off-the-shelf communication equipment aiming to satisfy a community’s demand for Internet access and services. These networks are a real world example of a collective that shares ICT resources. But while these community networks successfully achieve the IP connectivity over the shared network infrastructure, the deployment of applications inside of community networks is surprisingly low. Given that community networks are driven by volunteers, we believe that bringing in incentive-based mechanisms for service and application deployments in community networks will help in unlocking its true potential. We investigate in this paper such mechanisms to steer user contributions, in order to provide cloud services from within community networks. From the analysis of the community network’s topology, we derive two scenarios of community clouds, the local cloud and the federated cloud. We develop an architecture tailored to community networks which integrates the incentive mechanism we propose. In simulations of large scale community cloud scenarios we study the behaviour of the incentive mechanism in different configurations, where slices of homogeneous virtual machine instances are shared. Our simulation results allow us to understand better how to configure such an incentive mechanism in a future prototype of a real community cloud system, which ultimately should lead to realisation of clouds in community networks. Watch out for International Multitopic Conference 2009 that is coming up in December and will be held in Islamabad. The call for papers is now closed, though. The International Multitopic Conference 2009 (INMIC-2009) will be held in Islamabad, on 14-15 December 2009. It will be jointly organized by Mohammad Ali Jinnah University, Islamabad, and University of Engineering and Technology, Taxila, in association with IEEE Islamabad Section. Proceedings of INMIC 2009 conference will be published and the papers will also be available through IEEE Xplore ®. IEEE INMIC is held every year and INMIC 2009 will be the 13th in the series. INMIC has become Pakistan’s flagship technical conference with a broad scope, thereby inviting interest of a large audience. The conference targets research presentations by academic and professional researchers, and also includes a series of tutorials, enabling participants to learn about the latest trends in technology. Research contributions are expected from the participants, covering various disciplines under IEEE’s domain, including technical papers, panel discussions, tutorials and project exhibitions.